Blackwall Tunnel southern approach, SE10, 1997. Photo © David Secombe. The mock-Tudor building in front of the gas holder in the picture above is the former home of the 1980s comedy club The Tunnel Palladium, so called because the building sits only a few yards way from the mouth of the southern entrance to the Blackwall Tunnel. The club was run by the legendary local comic and promoter Malcolm Hardee, and it played host to many key figures in the alternative comedy circuit at the start of their careers. Amongst the legions of anecdotes concerning Malcolm Hardee, three are worth retelling here . . .
1) At the 1983 Edinburgh Fringe, he became annoyed by excessive noise from an adjacent comedy tent where Eric Bogosian was performing, and retaliated by stealing a tractor and driving it, naked, across Bogosian’s stage during his performance. 2) He stole Freddie Mercury’s 40th birthday cake and gave it to an old people’s home. 3) He pioneered a stage routine (later taken up by Chris Lynam) in which the performer sings There’s No Business like Show Business whilst holding a lit firework between his buttocks. 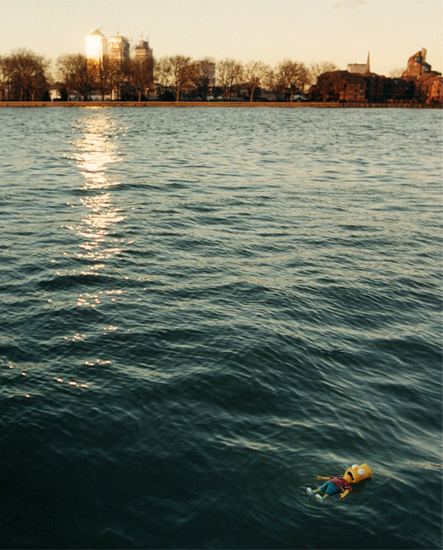 Malcolm Hardee died in January 2005, drowning in Greenland Dock, where his houseboat was moored; the Coroner’s verdict was that he had fallen into the dock whilst drunk. According to the police constable who retrieved Malcolm’s body from the water, he was found still clutching a bottle of beer in his right hand. The Thames, looking east from Hungerford Bridge, 2010. Photo © David Secombe. From 23 May Tate to Tate, a new boat service on the river Thames, will be available for gallery lovers. The service, which runs every forty minutes during gallery opening hours between Tate Modern and Tate Britain, will be launched on 22 May by The Mayor of London, Ken Livingstone. The boat also stops at the London Eye. 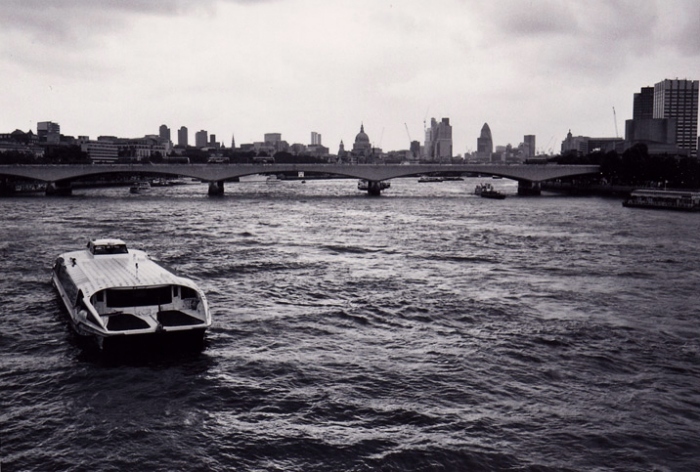 The Tate to Tate boat service, operated by Thames Clippers, is a state-of-the art 220 seat catamaran with specially commissioned exterior and interior designs by leading artist Damien Hirst. The boat is sponsored by St James Homes, a property developer. Now that Damien Hirst is the richest artist in the world (proof if any were needed of the global success of that strange London-based phenomenon known as ‘BritArt’), it seems entirely fitting that ‘the fastest’ commercial vessel on the Thames, ferrying passengers to and from the world’s most popular – some might say populist – art gallery, bears one of his patented designs. The Tate boat is decorated with Hirst’s bright, multi-coloured dots, and travels between those twin bastions of culture, Tate Modern and Tate Britain – the former fashioned from a derelict power station, the latter built on the site of a penitentiary. For good or ill, Hirst seems to be the artist who best embodies his time; one can’t imagine a Bacon Barge or a Rothko Raft, whereas our Damien’s spotty pleasure cruiser – made possible by a property consortium – seems completely, depressingly, apt. Isle of Dogs, 1988. Photo © David Secombe. 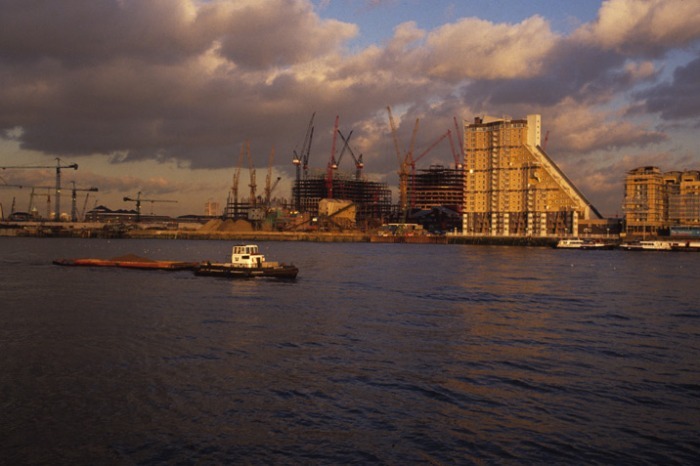 The photo above – taken for a magazine assignment to illustrate the growth of London’s Docklands – gives a small indication of the speculative building frenzy which characterised the mid-1980s. The building on the right in the photo above, newly constructed when this picture was taken, is Cascades, designed by Piers Gough for CZWG architects. Cascades was the first private apartment block to be built on the Isle of Dogs – a trailblazer for all the other developments of ‘executive homes’ (marginalising the ‘indigenous’ population, naturally) which – despite the occasional market wobble – have followed in its wake. Elsewhere on the Isle of Dogs at the time of this image, the massive foundations of Olympia and York’s Canary Wharf were being laid; gradually, the ethereal, silver profile of 1 Canada Square (the “tallest habitable building in Britain” according to Wikipedia) rose into the sky, elegantly dominating the landscape for miles around – until it was crowded by a cluster of far more vulgar towers belonging to big, bad corporations like Barclays and HSBC. If anyone wants to look for physical manifestations of the arrogance of capitalism, the Isle of Dogs has to be London’s most conspicuous example.